We depart Dingle taking the Slea Head Drive, a couple of hours before sunset, heading towards Slea Head, Coumeenoole, Dunmore Head, Dunquin and Clogher. 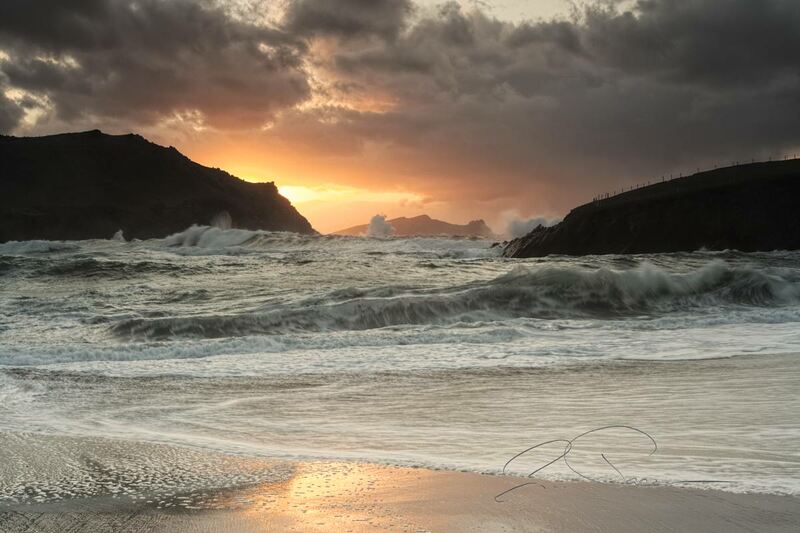 Here the Atlantic Ocean meets the edge of the Dingle Peninsula, in a series of spectacular views and vistas over the Blasket Islands and Sybil Head. We pause and stop to appreciate the atmospheric ruins, walk on sandy beaches and investigate the dramatic rocky coastline. Towards the end of the tour, we’ll pick an excellent location along the Wild Atlantic Way to perhaps capture a touch of colour, and maybe even a fabulous sunset to end the day. Our minibus picks you up in Dingle at a prearranged meeting point and time and we begin our tour with the drive past Ventry Harbour and on towards Slea Head and Coumeenoole Strand. 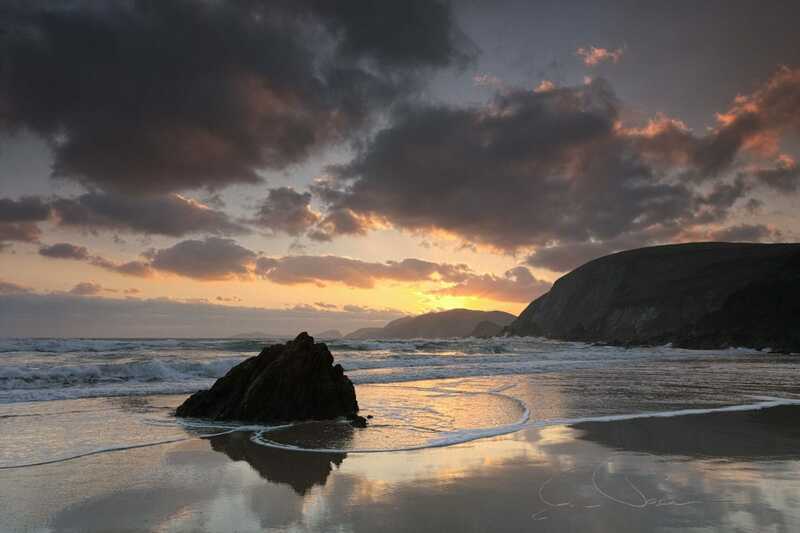 We stop at a number of locations with stunning vistas out over the Blasket Islands and the wild Atlantic ocean. As we continue our tour we’ll take some of the smaller backroads and farm tracks which lead to some fabulous beaches, coves and cliffs, all with outstanding views that are never seen from the main roads. You are welcome to be as experimental and adventurous with your photography as you want, we have tripods and filters that you can use for the duration of the tour. If you wish to try some low light and long exposure photography using your camera or device, please make sure you have some method of remotely operating the shutter such as a cable or Bluetooth accessory or be familiar with the delayed shutter timer on your camera or device. If you are bringing a smartphone or tablet and you have a selfie adapter bring it along as it can often be used as a tripod mount for your device. Sometimes your headphones can be used as a remote release. Do check the information page and download the recommended photography app for your device. We do have a limited number of smartphone and tablet, tripod attachments and Bluetooth releases that can be used for the duration of this tour, please contact us in advance if you’d like to use them. The Magic Hours Photography Tour is also available for dawn and sunrise as a custom activity. We do have a limited number of smartphone and tablet, tripod attachments and Bluetooth releases that can be used for the duration of the tour, please contact us in advance if you’d like to use them. 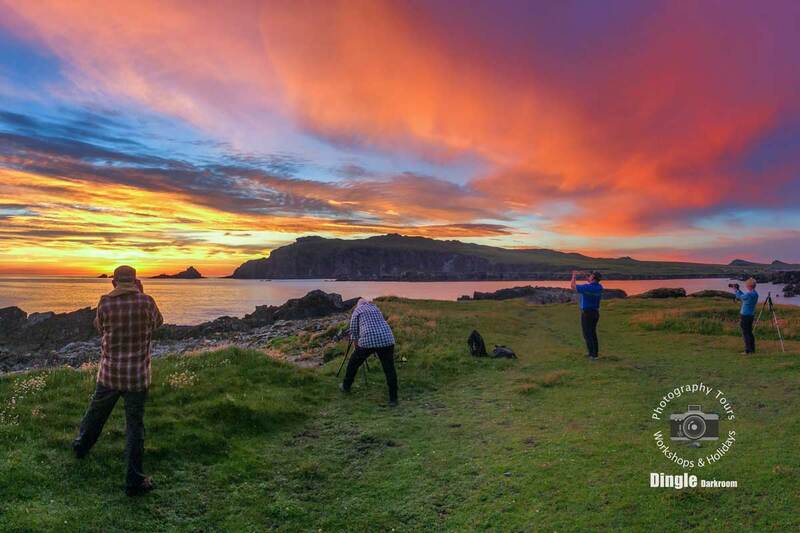 Just let us know on the tour if you’d rather have us taking the photos of you and your group with the backdrop of the stunning scenery along The Slea Head Drive. If you’d prefer a more dedicated photo-shoot and tour for an engagement or special group occasion, please get in touch with your requirements.